Hams and shoulders included on Dehesa de Extremadura Designation of Origin hams and shoulders come from pigs which accomplish basic requirements established by the Regulation Council. However, hams come from pure iberian breed pigs or authorised crossbreeding by the Current legislation in force. The Dehesa de Extremadura Designation of Origin certifies both origin and quality of iberian breed hams and shoulders, free-raised and fattened in pastures in Extremadura, and elaborates in natural cellars in the same area afterwards. After the careful curing and raising process, DO Dehesa de Extremadura hams and shoulders, should accomplish a set of very specific physical and organoleptic features. The external appearence of those hams and shoulders is long and stylised, with thin caña (shinbone) and preserving the hoof. The colour of the meat in the surface cut of DO Dehesa de Extremadura hams and shoulders may be pink or deep red, with fat infiltrations. Its flavour is soft, sweet or not salty. Its texture is not too fibrous of a shiny aspect, nice taste, touch and smell. The result is a pleasant aroma. About the weight, minimum weight for hams should be 5.75 kilos and 4 kilos for shoulders. 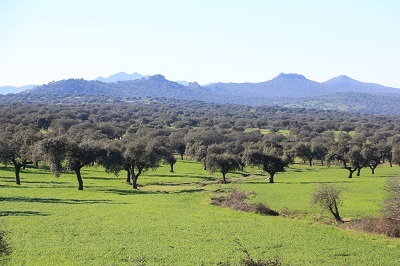 DO Dehesa de Extremadura hams and shoulders production area is extended all over Extremadura, in pastures placed in Cáceres and Badajoz. Pastures are formed by oaks, where pigs are feeds with acorns. Elaboration area for DO Dehesa de Extremadura hams and shoulders is formed by 85 towns distributed as follows: 40 in Badajoz, and 45 in Caceres. Those towns are mainly placed in San Pedro Sierra, Montánchez Sierra, southern Gredos, Ibor-Villuercas and southwestern Badajoz. 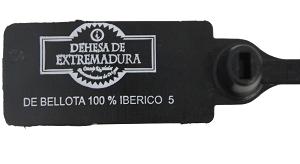 In order to guarantee all the pieces included in DO Dehesa de Extremadura, Regulation Council of DO Dehesa de Extremadura realizes many controls during the production process. 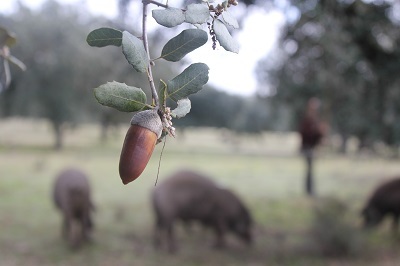 The pastures in Extremadura are placed in the production area of hams and shoulders, and conformed by oaks which are distributed all over Extremadura. Production area conformed by slaughterhouse, drying place and cellars; located in the towns included in D.O's geographical area. All pigs shoud be pure iberian breed or authorised crossdreedings by the current Legislation in force as long as the pig would be 75% ibérico or more. We can classify pigs in 4 big groups: 100% pure ibérico de bellota pata negra, 75% ibérico de bellota, Cebo de campo 100% ibérico and 75% ibérico. - Ibérico Bellota hams: pigs which have only been feed with acorns and pastures. - Ibérico Cebo de Campo hams: pigs which has been feed during its fattening phase with pastures, feeding and some acorns. Pigs should be free-ranged during the fattening phase. In addition, minimum distance between watering and feeding points should be 100 metres. Thus, physical exercice of the pig and fat infiltrations in the muscla mass are fomented. Maximum pigs density per hectare is 15 for Cebo de campo hams and 2 for Bellota hams. There is a minimum slaughtering age may very according to pig's feeding. For Bellota pigs, the minimum slaughtering age is 14 months, while for those Cebo de campo hams is 12 months. Humidity and temperature controls are realized in drying places with outside windows and natural weather conditions of the production area. In order to verify we are actually buying a ham or shoulder with DO Dehesa de Extremadura certification, it is important to pay attention to the label. 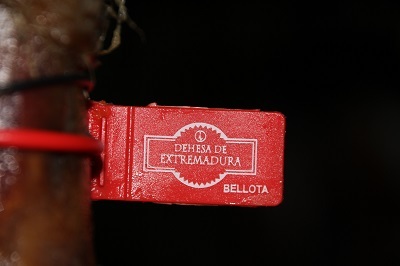 We will find a compulsory identification of DO Dehesa de Extremadura and identifying its category. 100% ibérico de bellota pata negra hams and shoulders: red label and black seal. 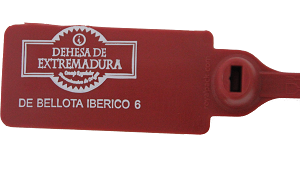 75% ibérico de bellota hams and shoulders: red label and seal. 100% - 75% ibérico cebo de campo hams and shoulders: green label and sean. All the DO Dehesa de Extremadura hams and shoulders may be traded with bone, boneless, in pieces or sliced. An identification or label should always be in the packing in order to know its origin. 6. Curiosities of the D.O. Dehesa de Extremadura pieces. -Zoomorphic stone sculptures called "Verracos" (boar), very similar to pigs, dating between V and II century b.C., found in some towns in Extremadura. - Charles V the Emperor favorite hams came from Montánchez (Cáceres). -The informed existence of Fuero de Montánchez and its pasture in 1236, given to the acorns production for the cattle-raiser. The Designation of Origin Dehesa de Extremadura has been created in 1990, motivated by the number of iberian pigs raised in Extremadura pastures but finally elaborated in other areas of Spain. 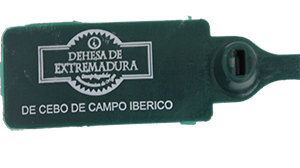 In the same year, DO Dehesa de Extremadura Product Specifications document is created in 1990, and it is lately, in 1996, recognised by European Union.